A new device made up of a tiny camera, an earpiece and a very powerful wearable computer could drastically improve the lives of some 21 million Americans living with a visual impairment. 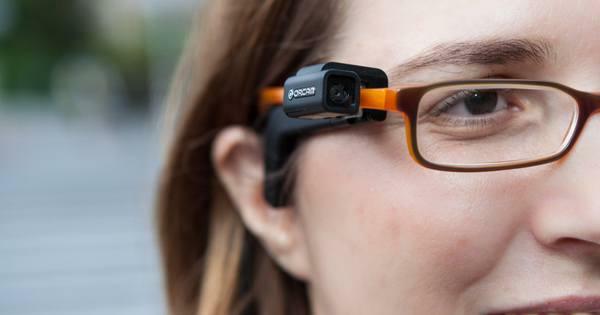 OrCam is not primarily a mobility aid, so it won’t replace a cane, but what it can do is help a wearer recognize and interpret the world around them by reading printed text off a variety of surfaces and recognizing products and faces. OrCam was founded in Israel by Amnon Shashua, a computer science professor at Hebrew University in Jerusalem. The device is based on computer vision algorithms he pioneered with another computer scientist, Shai Shalev-Shwartz, and Dr. Yonatan Wexler, a former graduate student who is now senior vice president of research and design for OrCam. Here’s how it works: The device is attached to a pair of glasses using a tiny magnet. While wearing the glasses, the user can then point to anything with their finger, be it a product at the grocery store or an article in the newspaper. OrCam will interpret the object or text via the in-ear microphone. One of its most helpful features lies with money recognition. Hold up a $5 bill any which way, and OrCam will recognize it. This helps visually impaired people while they are out and about at the store. OrCam launched in the U.S. in 2015 and is also available in Canada. They recently unveiled an upgraded model at the Consumer Electronics Show in Las Vegas earlier this month. The company offers in-person training to all new users. While OrCam was developed specifically with the visually impaired in mind, the company is also adapting the product for other markets. Hoping to broaden their audience, the Israeli-based company recently announced a new digital personal assistant that clips onto a shirt or necklace and could give Apple’s Siri or Google Glass some competition down the road. “We envision an always-on, personal assistant as the next step in wearable technology,” Shashua told the Wall Street Journal .